Photographer: Xevi Muntane. Model(s): Tilda Swinton. Source: Candy Magazine. 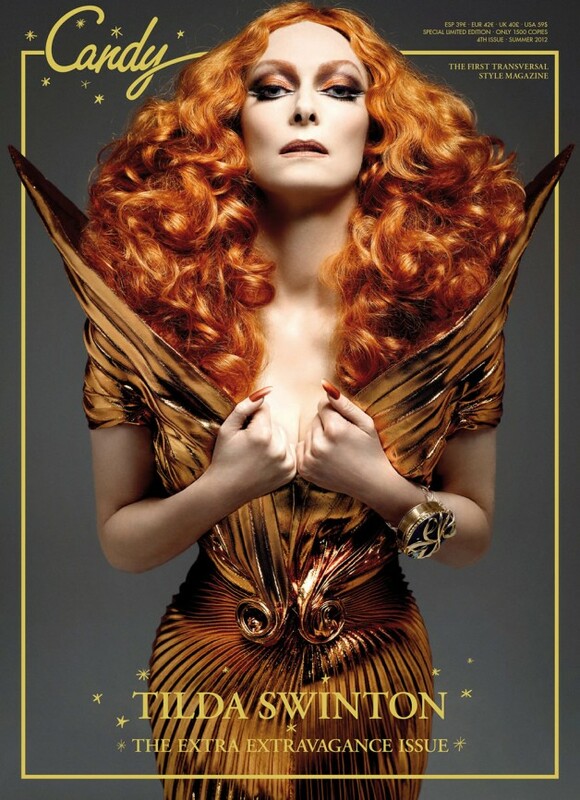 In all it’s sublime splendor, the elusive Candy Magazine has once again ignited a passionate response for it’s pitch-perfect issue # 4, featuring Tilda Swinton, by Xevi Muntane. This prolific publication, by visionary Luis Venegas, is “dedicated to celebrating transvestism, transsexuality, cross-dressing and androgyny.” A covet-worthy display of inspiration & expression. Candy looks a what moves us to create, and what forms those creations take. They celebrate all that is artful in this life. I see Candy Magazine as a beacon in the night – providing light to those of us trying to produce like-minded content. I started Fashioncow to extol the virtues of modern pop-culture, and to honor the “Art of Fashion.” I park myself at the “crossroads” of Fashion & Philosophy so I may write the beautiful truth. And just when I feel completely alone, I look up and see the “faces” of my brothers/sisters fighting for the same thing. Fighting to escape the tepid waters of mediocrity, and come together to raise our artistic standards. Fighting for the distinct right of the talented to rise up and take their rightful positions.